Over the past decade, science and technology has evolved enough to slowly eliminate the complete need of human involvement in most tasks. Early 2014, a popular article by ‘The Economist’ was published with the title, “The Future of Jobs: The Onrushing Wave.” The piece spoke about how technological advancements are playing a huge role in eliminating jobs that need human resources. This line of thought with respect to security begs the question — Can human security guards be completely replaced with robots? 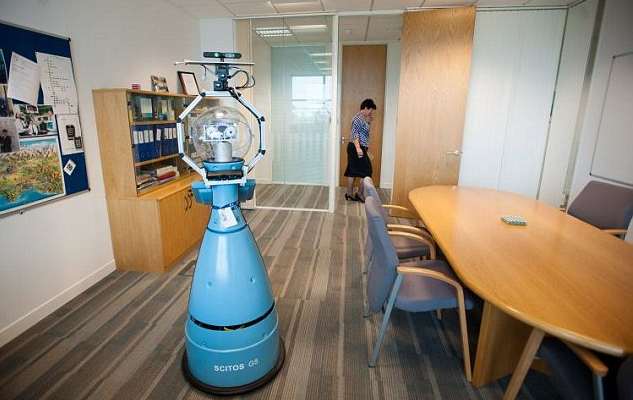 The first robotic security guard that was launched in the United Kingdom is called, ‘Bob’. Built to patrol the headquarters of G4S, (one of the largest provider of human security guards), Bob is doing a pretty decent job at not only keeping a vigilant eye during patrolling, but also managing to hold a basic conversation with anyone it bumps into. Bob, Britain’s first robotic security guard. Replacing human security guards with robots completely eliminates the need of initial training and then the periodic refresher/up-gradations of the same training. This also takes away the need of paying regular wages, effectively combating a high turnover and the continuous need to make sure that the employees are satisfied and are working as per their duties. The biggest threat of using any technological device is that they are not intuitive in nature, so in case of an emergency they would end up taking action as per their programme, ignoring an obvious better option. Also, if a situation that they are not programmed for arises, they will be completely clueless about what action to take. To add to this disadvantage, these devices are always at a risk of breaking down. myGate understands the pitfalls of using only technology or only human security guards and bridges these gaps with an intelligent security system. myGate acts as a force multiplier for human security guards by helping them perform better by integrating technology and creating a security ecosphere where safety and security of the residents is greatly enhanced. myGate makes sure that the blend between human and technology is just right so that, while technology takes over the routine work, maintaining human intervention in case anything goes wrong is always an option in hand. We have created different solutions for enhancing the existing security features in an apartment without compromising on the convenience of the residents. All the solutions offered by us leverage to using technology to the best and are completely in sink with the security guards, be it our automated guest authentication, real time domestic help management, attandance management, etc. To know more about why myGate stands out against any other security services, Click Here. myGate is already deployed at over 100+ communities in India and this number only seems to be increasing. With customers like Adarsh, Shobha, Mantri and Salarpuria among the many others, myGate is latching its roots in the security space of the gated communities in the country rapidly. Do click on the link to know more and we will be happy to be there for a free demo.